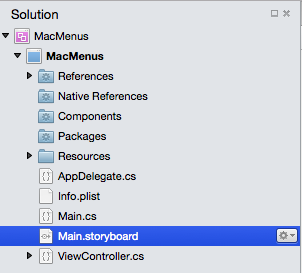 This article covers working with menus in a Xamarin.Mac application. 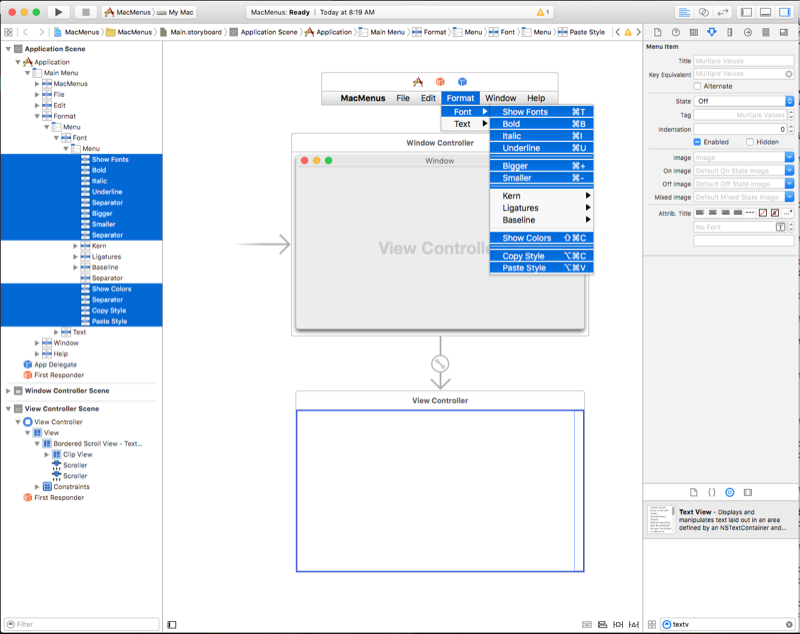 It describes creating and maintaining menus and menu items in Xcode and Interface Builder and working with them programmatically. 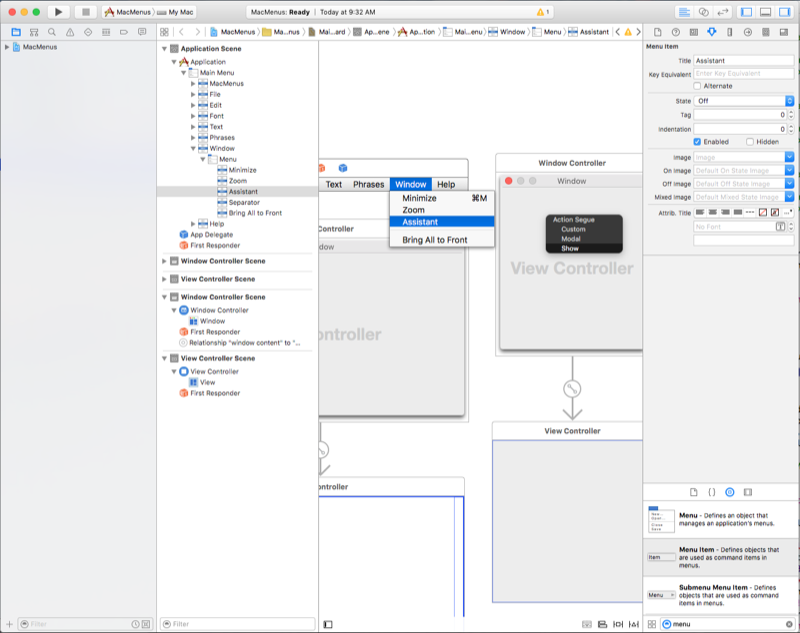 When working with C# and .NET in a Xamarin.Mac application, you have access to the same Cocoa menus that a developer working in Objective-C and Xcode does. 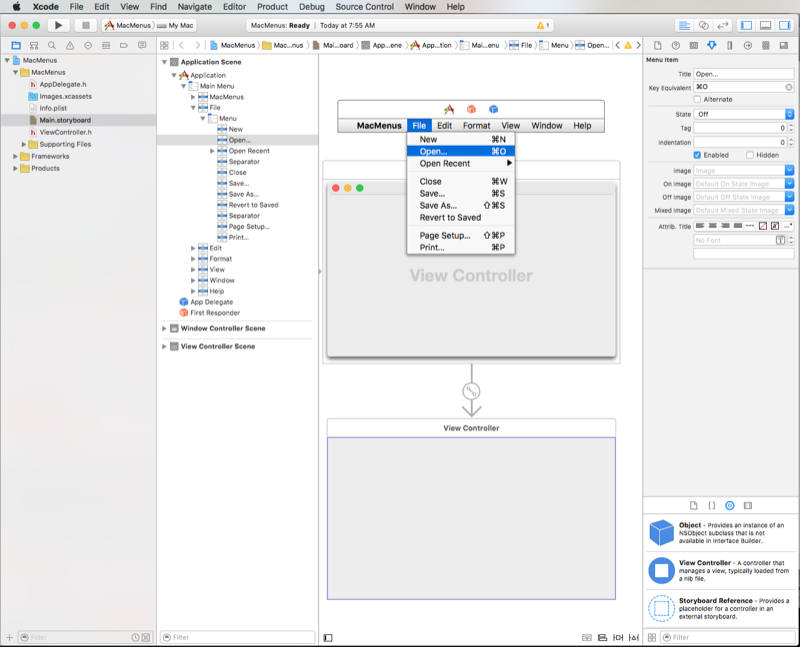 Because Xamarin.Mac integrates directly with Xcode, you can use Xcode's Interface Builder to create and maintain your menu bars, menus, and menu items (or optionally create them directly in C# code). 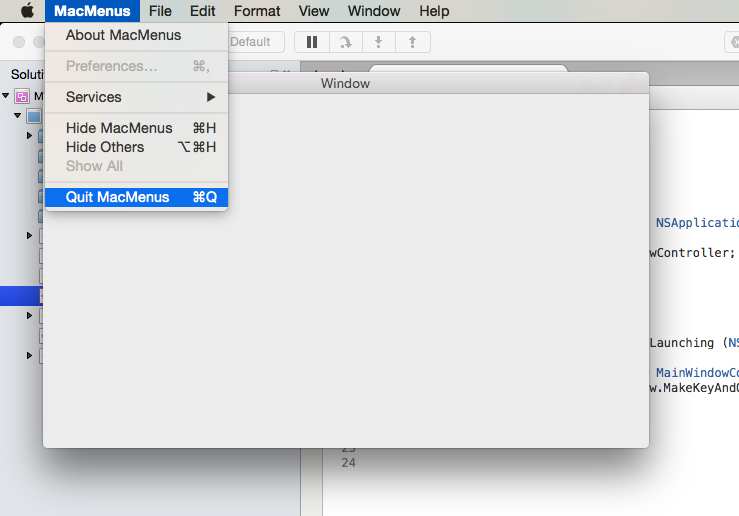 The application's menu bar - This is the main menu that appears at the top of the screen for every Mac application. Contextual menus - These appear when the user right-clicks or control-clicks an item in a window. The status bar - This is the area at the far right side of the application menu bar that appears at the top of the screen (to the left of the menu bar clock) and grows to the left as items are added to it. Dock menu - The menu for each application in the dock that appears when the user right-clicks or control-clicks the application's icon, or when the user left-clicks the icon and holds the mouse button down. Pop-up button and pull-down lists - A pop-up button displays a selected item and presents a list of options to select from when clicked by the user. A pull-down list is a type of pop-up button usually used for selecting commands specific to the context of the current task. Both can appear anywhere in a window. 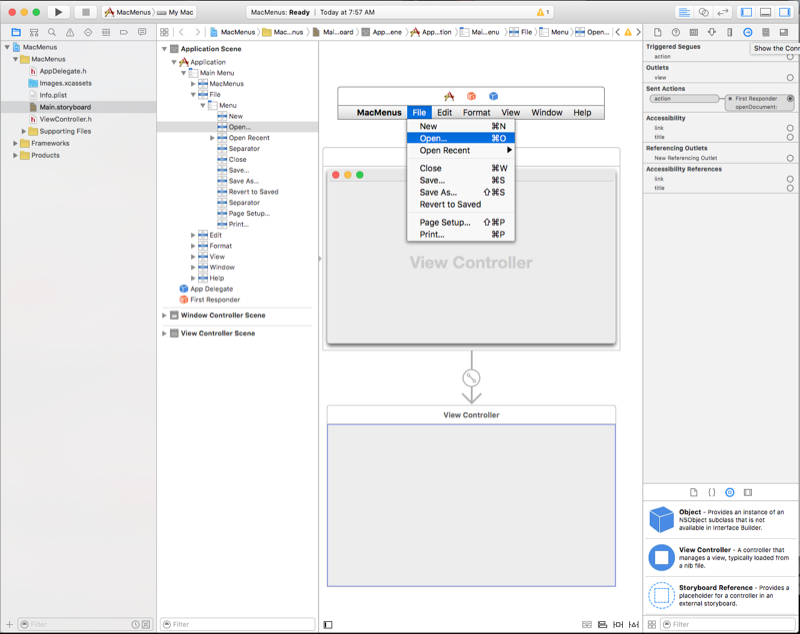 In this article, we'll cover the basics of working with Cocoa menu bars, menus, and menu items in a Xamarin.Mac application. 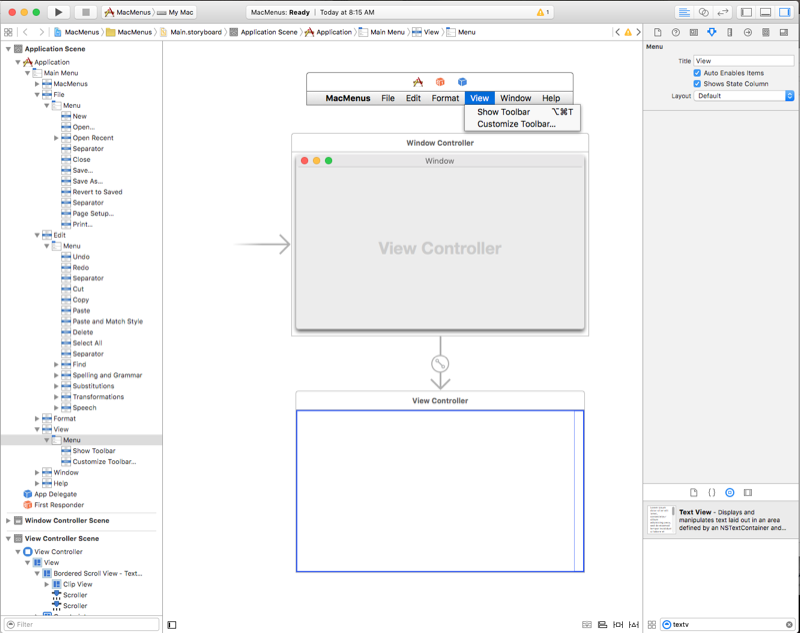 It is highly suggested that you work through the Hello, Mac article first, specifically the Introduction to Xcode and Interface Builder and Outlets and Actions sections, as it covers key concepts and techniques that we'll be using in this article. 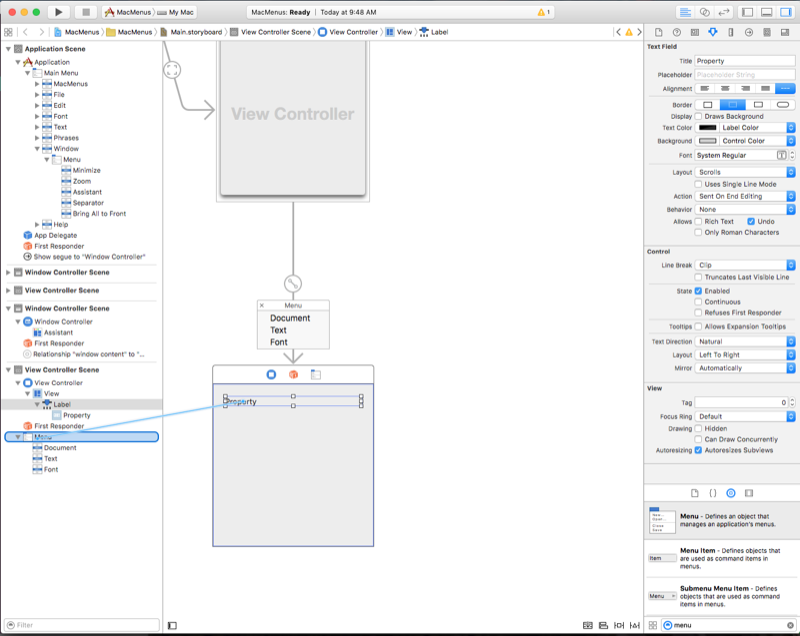 You may want to take a look at the Exposing C# classes / methods to Objective-C section of the Xamarin.Mac Internals document as well, it explains the Register and Export attributes used to wire-up your C# classes to Objective-C objects and UI elements. Items on this menu bar are activated or deactivated based on the current context or state of the application and its user interface at any given moment. 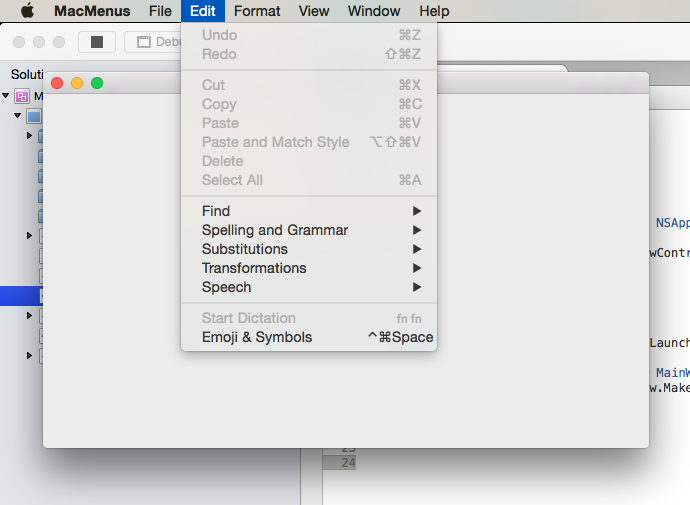 For example: if the user selects a text field, items on the Edit menu will be come enabled such as Copy and Cut. 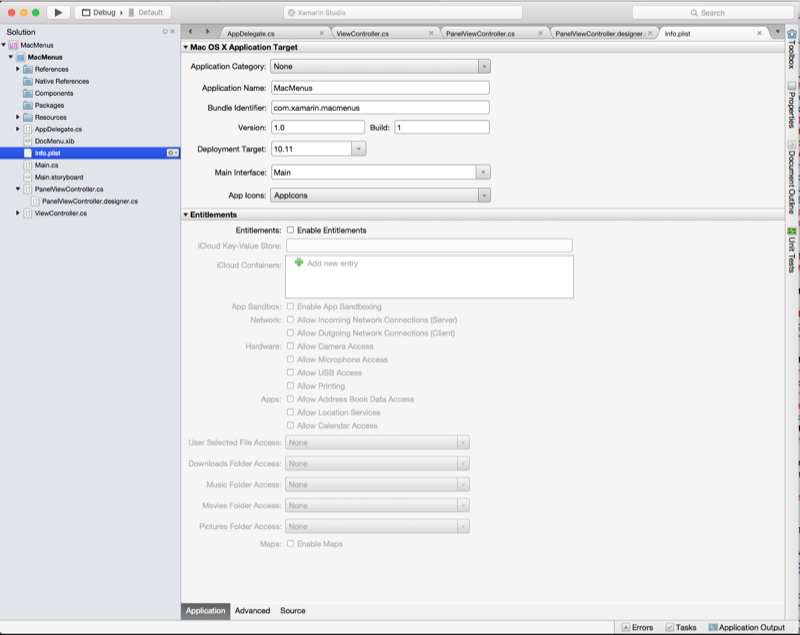 Apple menu - This menu provides access to system wide items that are available to the user at all times, regardless of what application is running. These items cannot be modified by the developer. 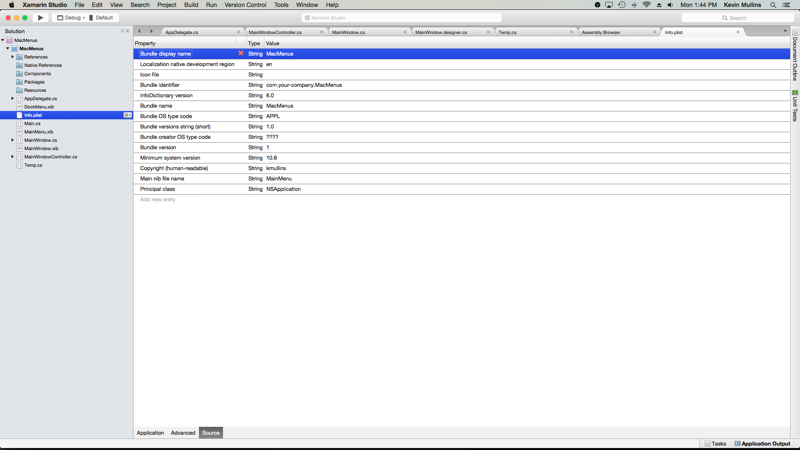 App menu - This menu displays the application's name in bold and helps the user identify what application is currently running. It contains items that apply to the application as a whole and not a given document or process such as quitting the application. 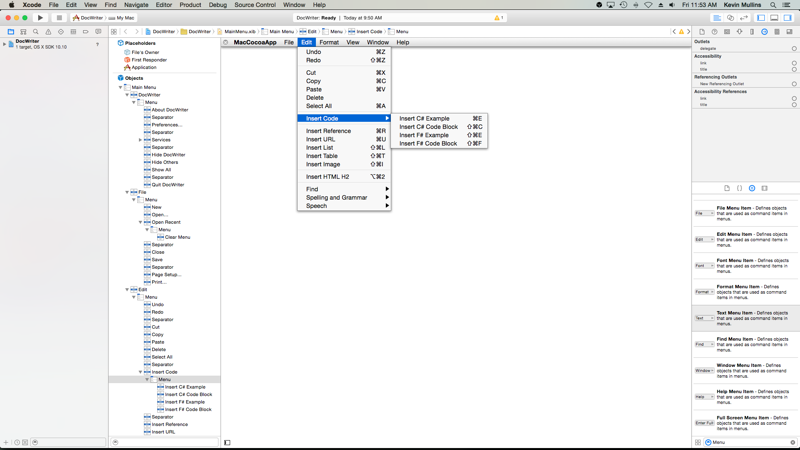 File menu - Items used to create, open, or save documents that your application works with. 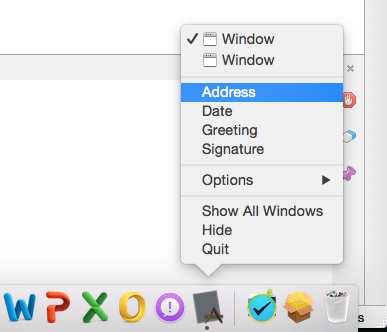 If your application is not document-based, this menu can be renamed or removed. 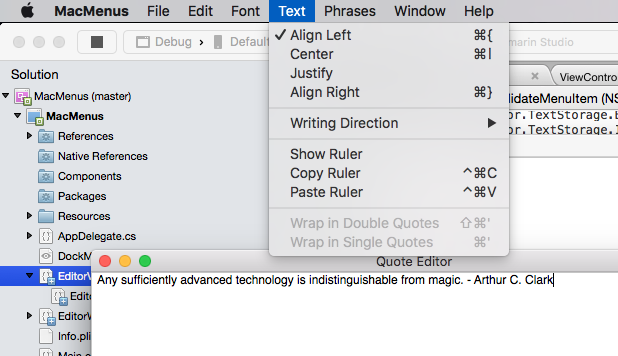 Edit menu - Holds commands such as Cut, Copy, and Paste which are used to edit or modify elements in the application's user interface. 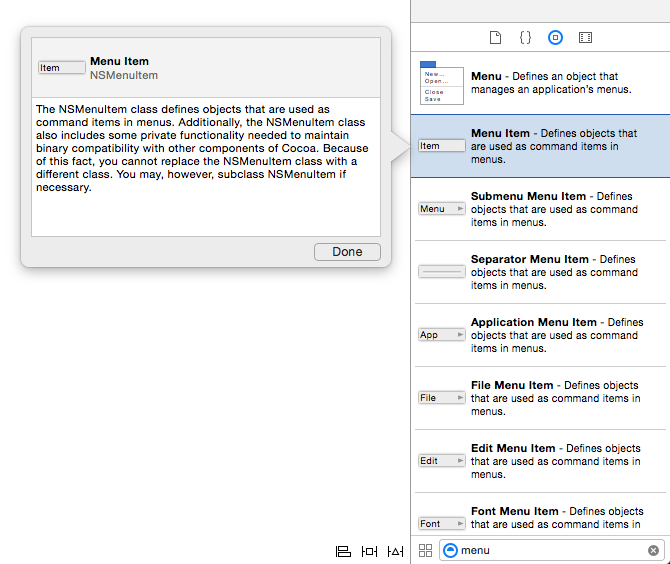 Format menu - If the application works with text, this menu holds commands to adjust the formatting of that text. 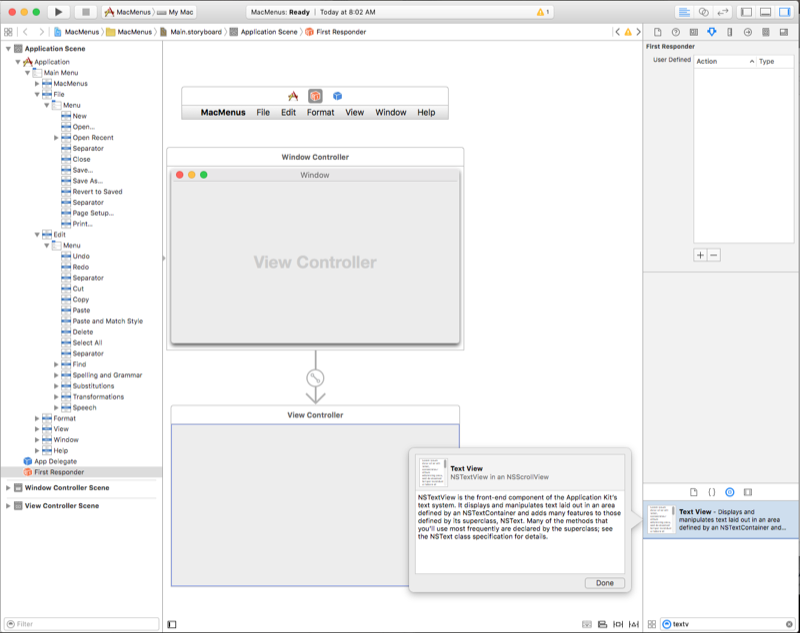 View menu - Holds commands that affect how content is displayed (viewed) in the application's user interface. Application-specific menus - These are any menus that are specific to your application (such as a bookmarks menu for a web browser). They should appear between the View and Window menus on the bar. Window menu - Contains commands for working with windows in your application, as well as a list of current open windows. Help menu - If your application provides onscreen help, the Help menu should be the right-most menu on the bar. For more information about the application menu bar and standard menus and menu items, please see Apple's Human Interface Guidelines. We'll get into adding, editing, and deleting menus and items later in this article. For now we just want to see what menus and menu items are available by default and how they have been automatically exposed to code via a set of predefined outlets and actions (for more information see our Outlets and Actions documentation). Why is this important? 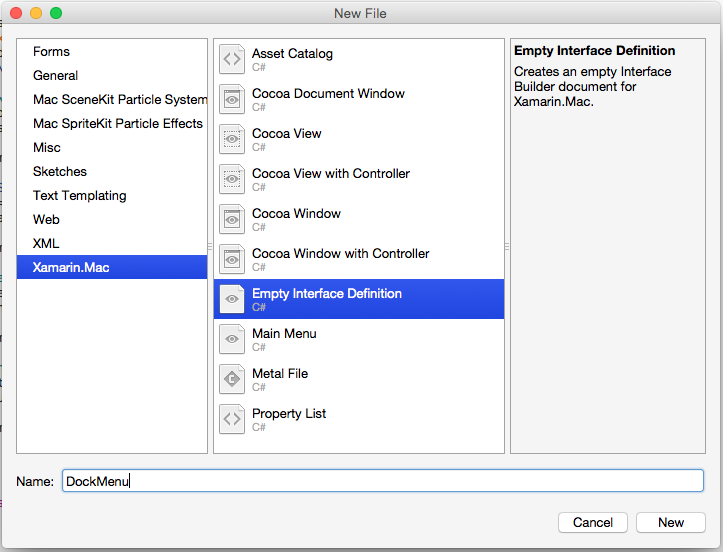 In the next section will see how these automatically-defined actions work with other Cocoa user interface elements to automatically enable and disable menu items, as well as, provide built-in functionality for the items. Later we'll be using these built-in actions to enable and disable items from code and provide our own functionality when they are selected. 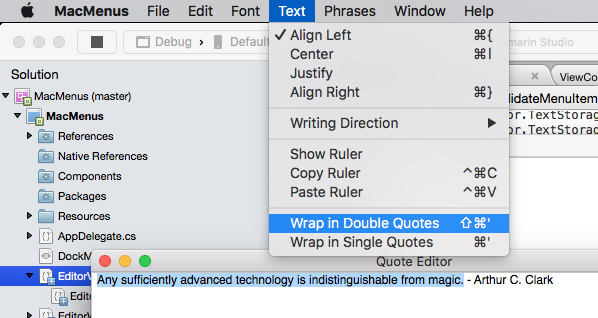 Notice how the Cut, Copy, and Paste items are automatically enabled and fully functional, all without writing a single line of code. What's going on here? 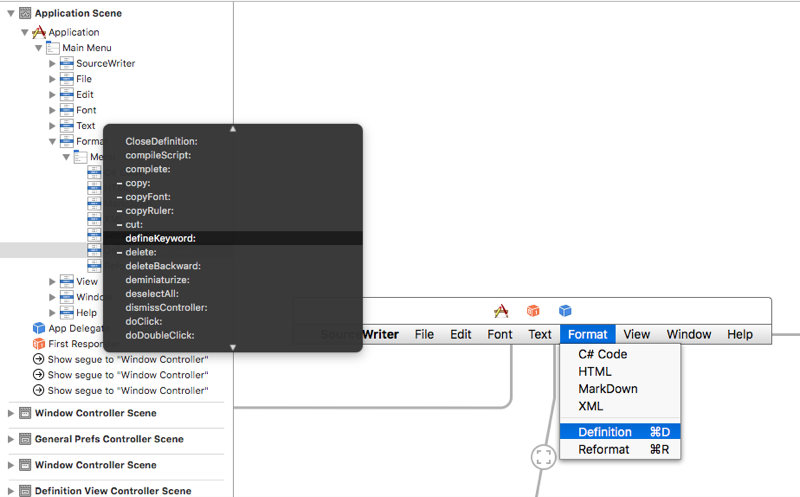 Remember the built-in predefine actions that come wired up to the default menu items (as presented above), most of the Cocoa user interface elements that are part of macOS have built in hooks to specific actions (such as copy:). So when they are added to a window, active, and selected, the corresponding menu item or items attached to that action are automatically enabled. If the user selects that menu item, the functionality built into the UI element is called and executed, all without developer intervention. Automatic menu enabling - A menu item is enabled if NSMenu can find an appropriate object that responds to the action that the item is wired-up to. 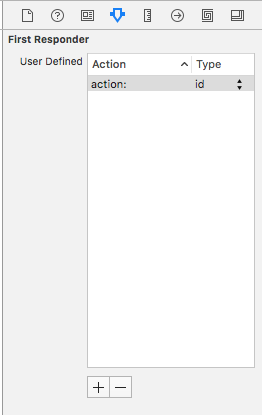 For example, the text view above that had a built-in hook to the copy: action. Custom actions and validateMenuItem: - For any menu item that is bound to a window or view controller custom action, you can add the validateMenuItem: action and manually enable or disable menu items. Manual menu enabling - You manually set the Enabled property of each NSMenuItem to enable or disable each item in a menu individually. To choose a system, set the AutoEnablesItems property of a NSMenu. true is automatic (the default behavior) and false is manual. 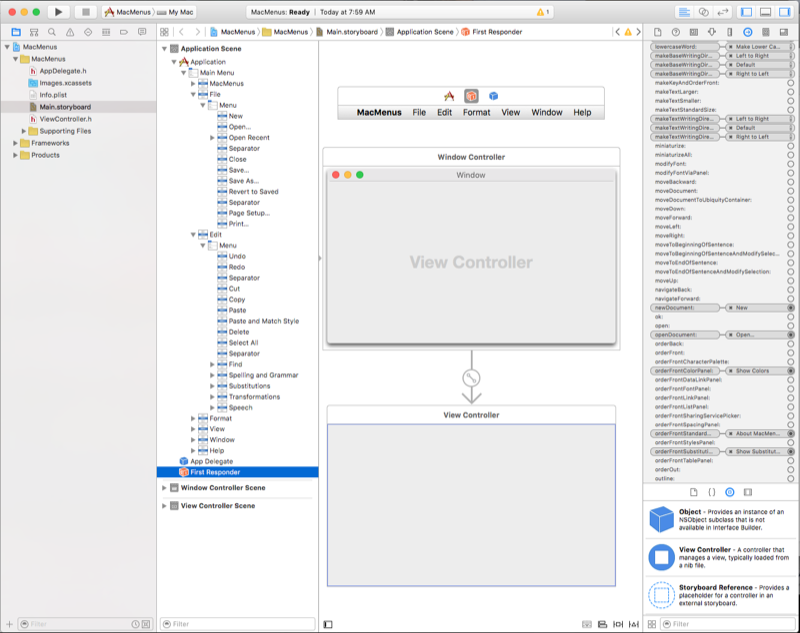 If you choose to use manual menu enabling, none of the menu items, even those controlled by AppKit classes like NSTextView, are updated automatically. You will be responsible for enabling and disabling all items by hand in code. As stated above, for any menu item that is bound to a Window or View Controller Custom Action, you can add the validateMenuItem: action and manually enable or disable menu items. // a range is NOT selected. 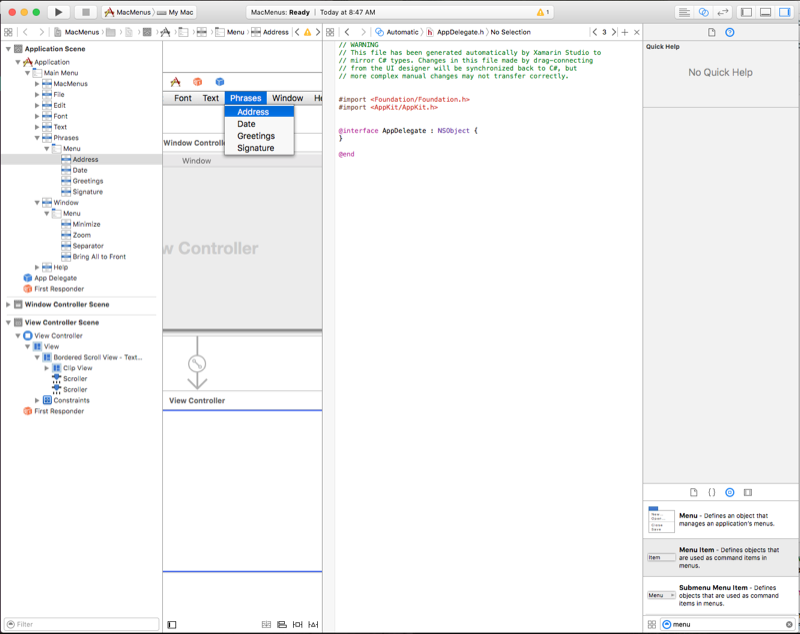 As we have seen above, just by adding specific Cocoa user interface elements to our UI design (such as a text field), several of the default menu items will be enabled and function automatically, without having to write any code. 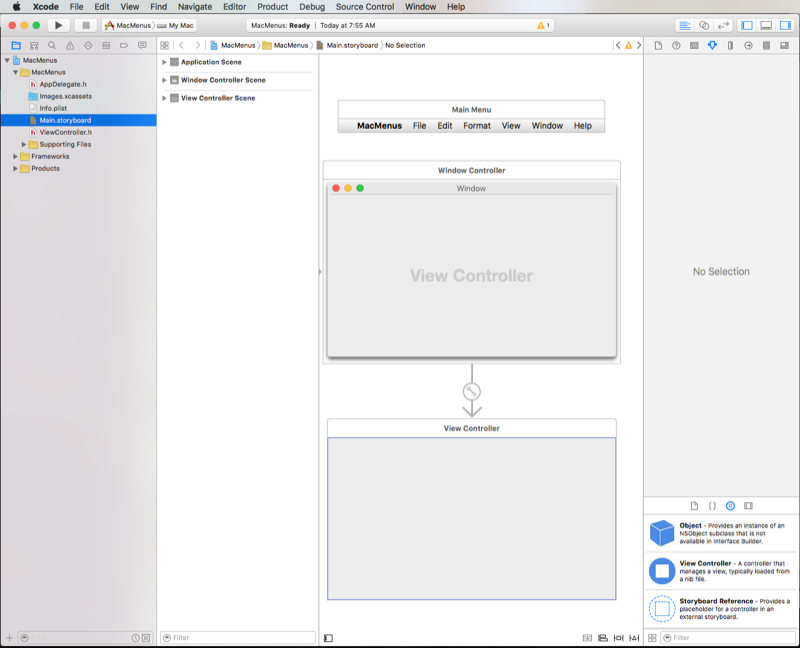 Next let's look at adding our own C# code to our Xamarin.Mac project to enable a menu item and provide functionality when the user selects it. For example, let say we want the user to be able to use the Open item in the File menu to select a folder. Since we want this to be an application-wide function and not limited to a give window or UI element, we're going to add the code to handle this to our application delegate. Next let's look at creating our own menu, menu items, and actions and responding to them in code. 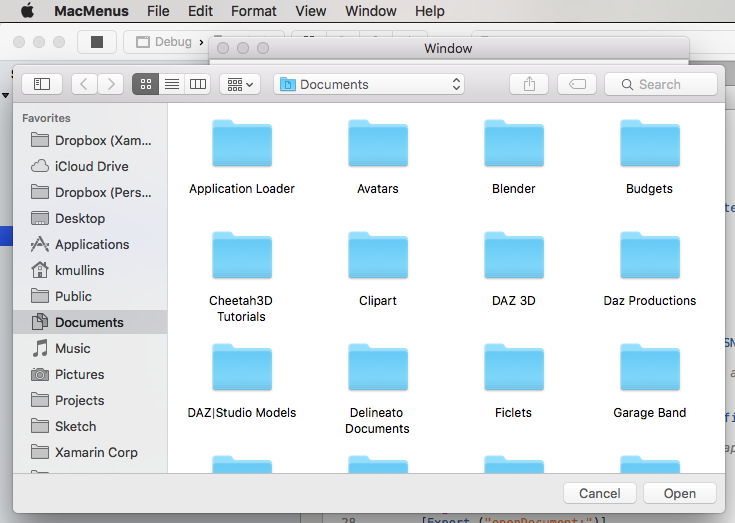 By default, the File menu contains an Open Recent item that keeps track of the last several files that the user has opened with your app. 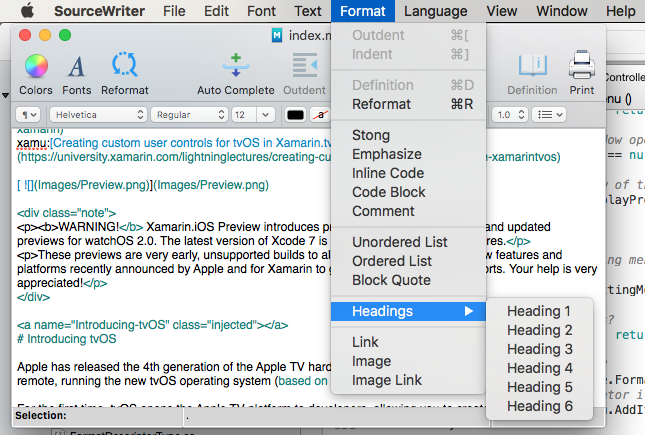 If you are creating a NSDocument based Xamarin.Mac app, this menu will be handled for you automatically. 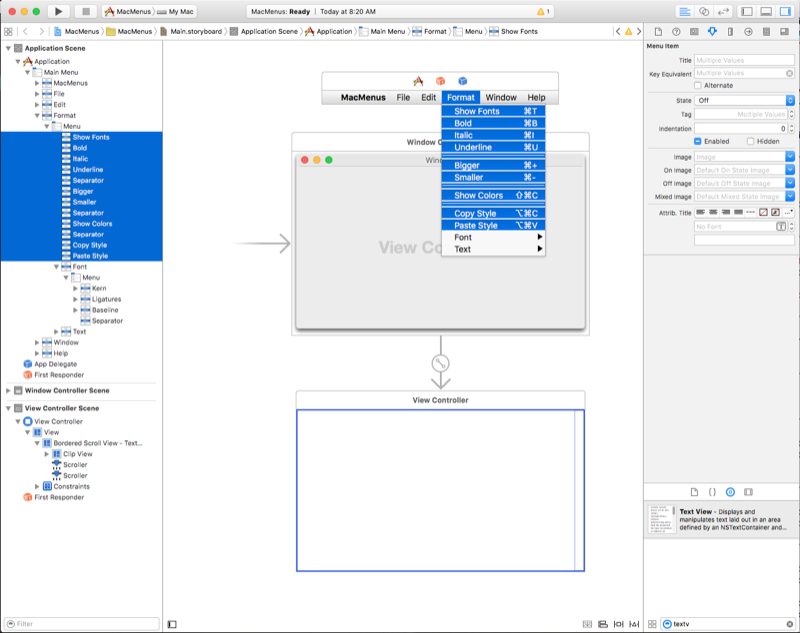 For any other type of Xamarin.Mac app, you will be responsible for managing and responding to this menu item manually. 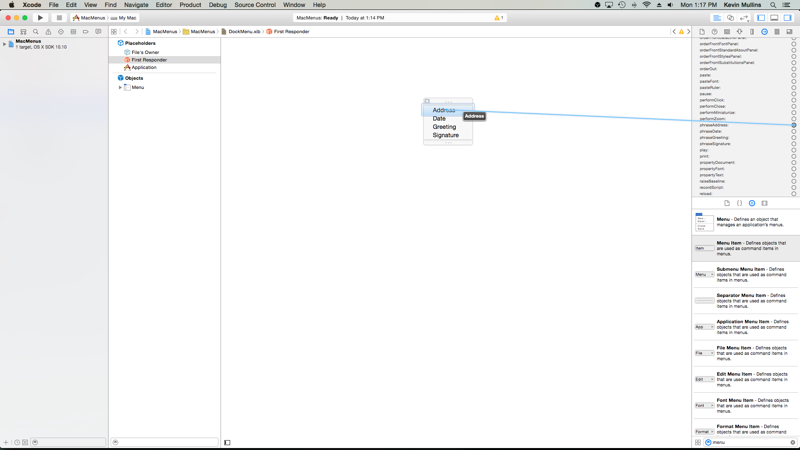 Even though your app is not using NSDocuments, you still use the NSDocumentController to maintain the Open Recent menu by sending a NSUrl with the location of the file to the NoteNewRecentDocumentURL method of the SharedDocumentController. Return true if the file can be opened, else return false and a built-in warning will be displayed to the user that the file could not be opened. // Is the file already open? 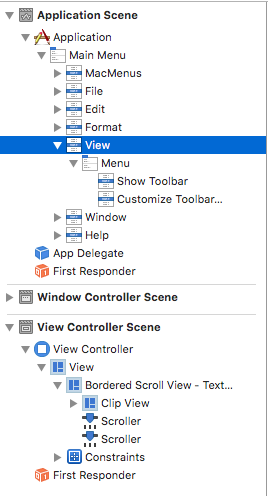 Based on the requirements of your app, you might not want the user to open the same file in more than one window at the same time. 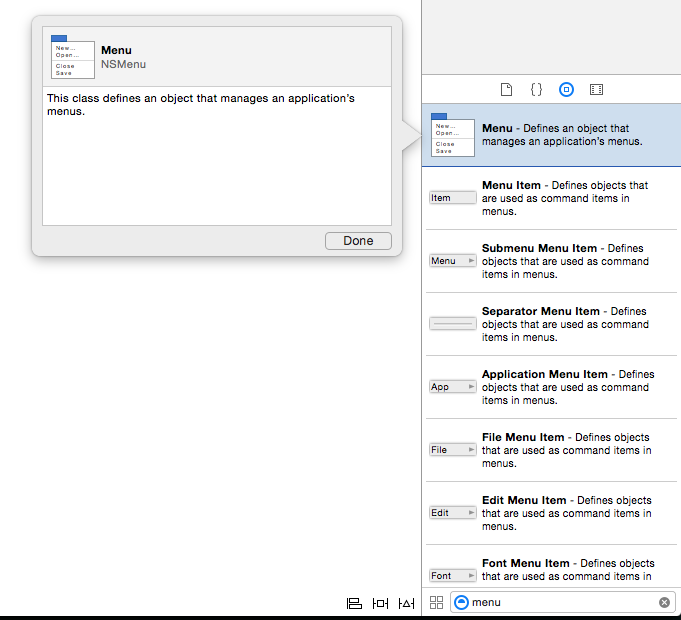 In our example app, if the user chooses a file that is already open (either from the Open Recent or Open.. menu items), the window that contains the file is brought to the front. 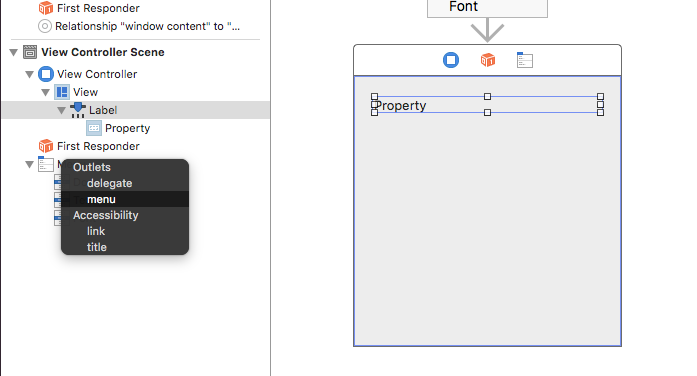 Just like the built-in First Responder actions that come pre-wired to standard menu items, you can create new, custom actions and wire them to menu items in Interface Builder. 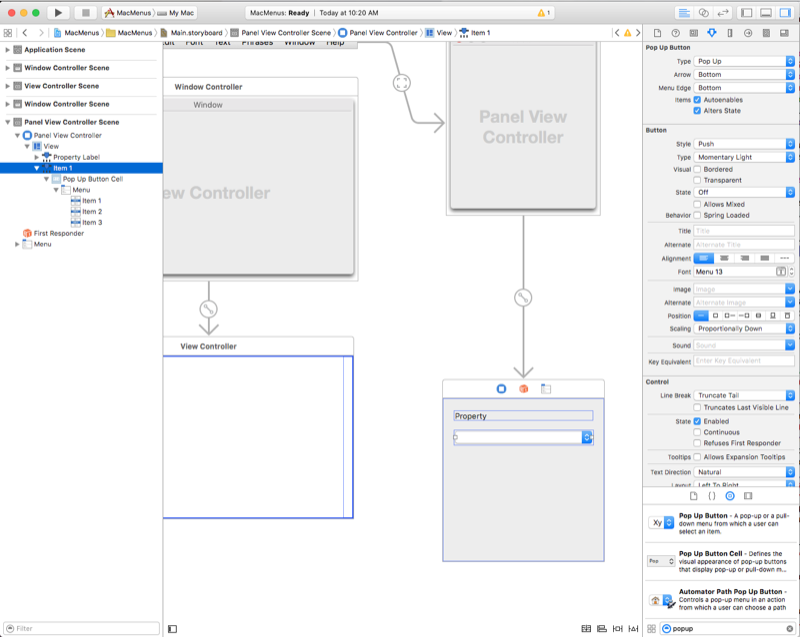 As we have seen in the previous sections, a Xamarin.Mac application comes with a preset number of default menus and menu items that specific UI controls will automatically activate and respond to. 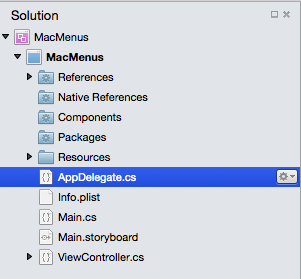 We have also seen how to add code to our application that will also enable and respond to these default items. In this section we will look at removing menu items that we don't need, reorganizing menus and adding new menus, menu items and actions. Save the changes to the menu bar. 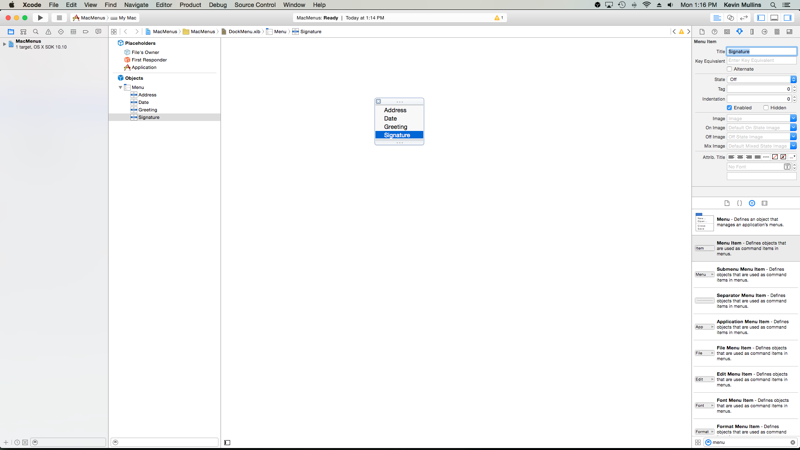 Control-drag from the Address menu item to the AppDelegate.h file. 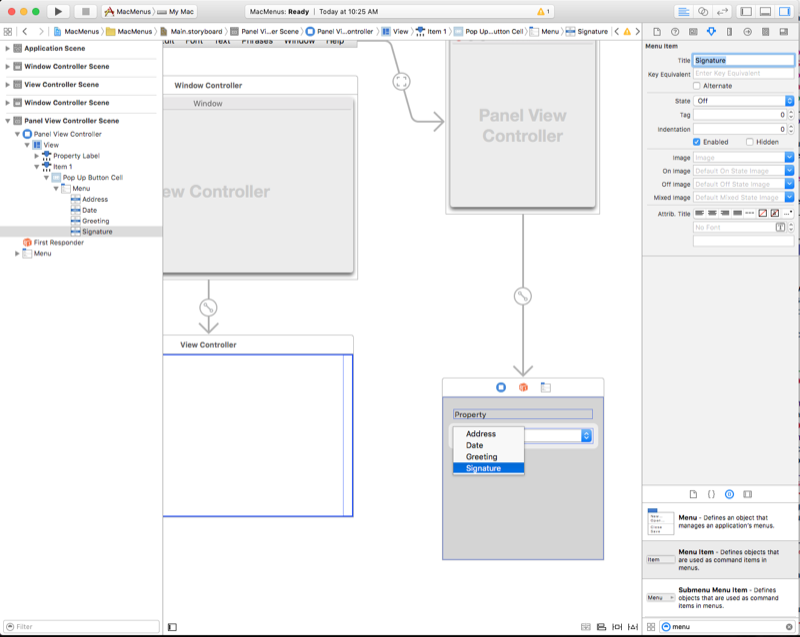 Here we've made the AppDelegate a partial class so that we can use the actions and outlets that we defined in Interface Builder. 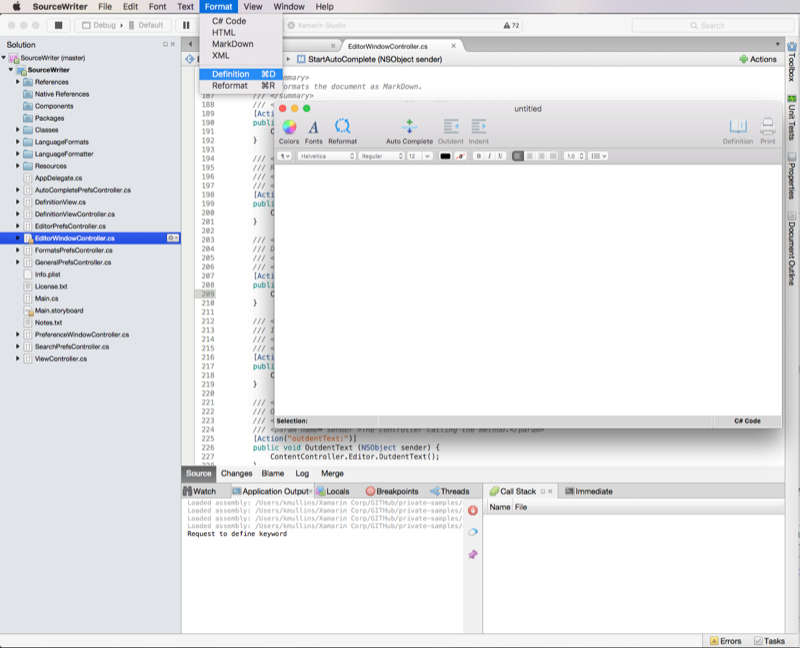 We also expose a textEditor to track which window is currently in focus. 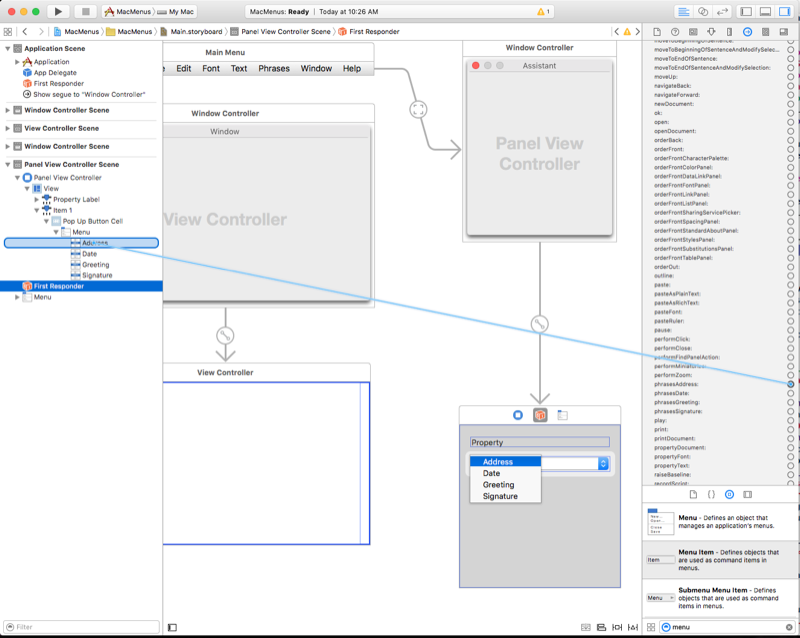 Now that we have the basics of working with the application menu bar down, let's look at creating a custom contextual menu. 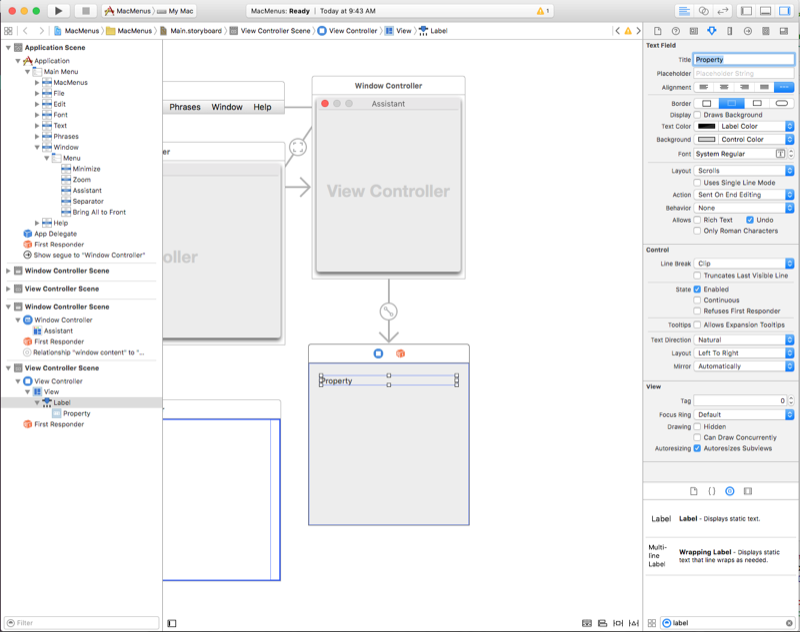 In addition to creating menus and menu items with Xcode's Interface Builder, there might be times when a Xamarin.Mac app needs to create, modify, or remove a menu, sub-menu, or menu item from code. // Add separator or item? If you need to remove any menu or menu item from the app's user interface, you can use the RemoveItemAt method of the NSMenu class simply by giving it the zero based index of the item to remove. 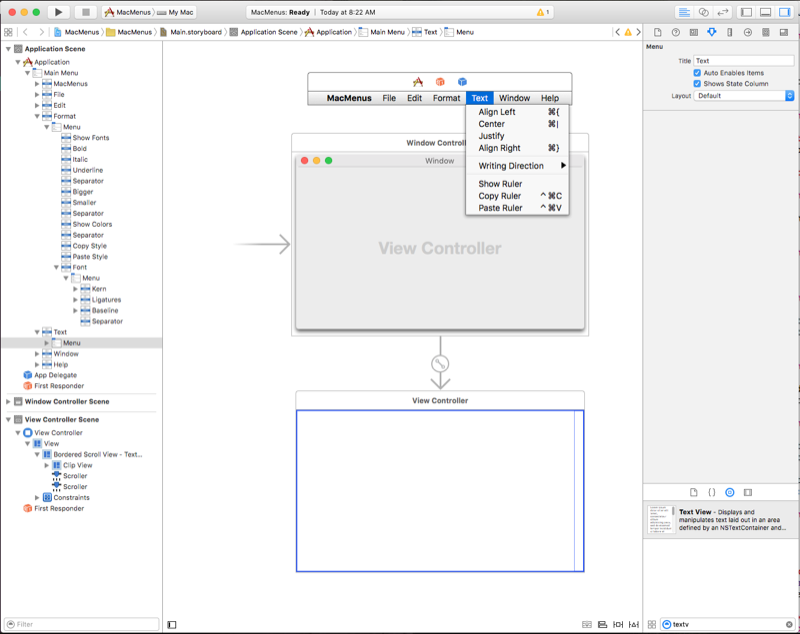 In the case of the code above, the first four menu items are created in Xcode's Interface Builder and aways available in the app, so they are not removed dynamically. Contextual menus appear when the user right-clicks or control-clicks an item in a window. By default, several of the UI elements built into macOS already have contextual menus attached to them (such as the text view). However, there might be times when we want to create our own custom contextual menus for a UI element that we have added to a window. 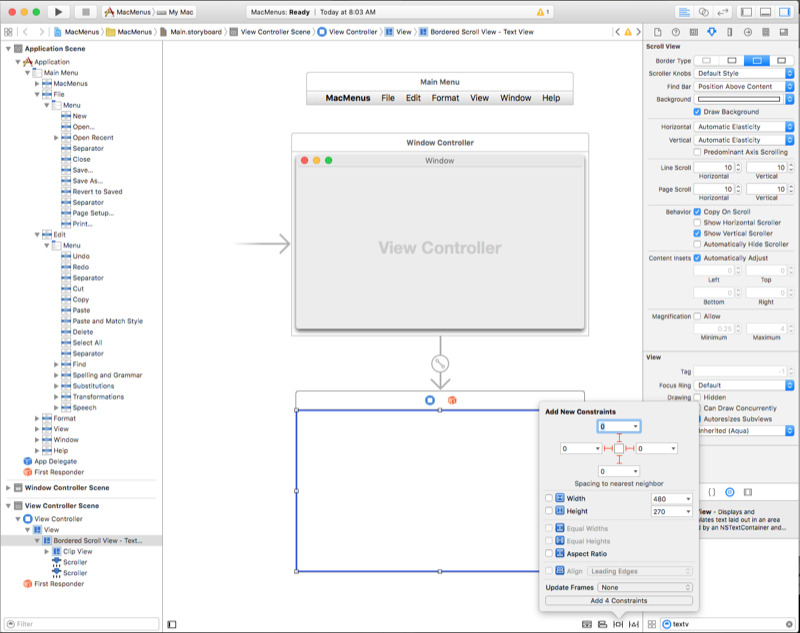 Switch back to Visual Studio for Mac to sync, then return to Interface Builder. 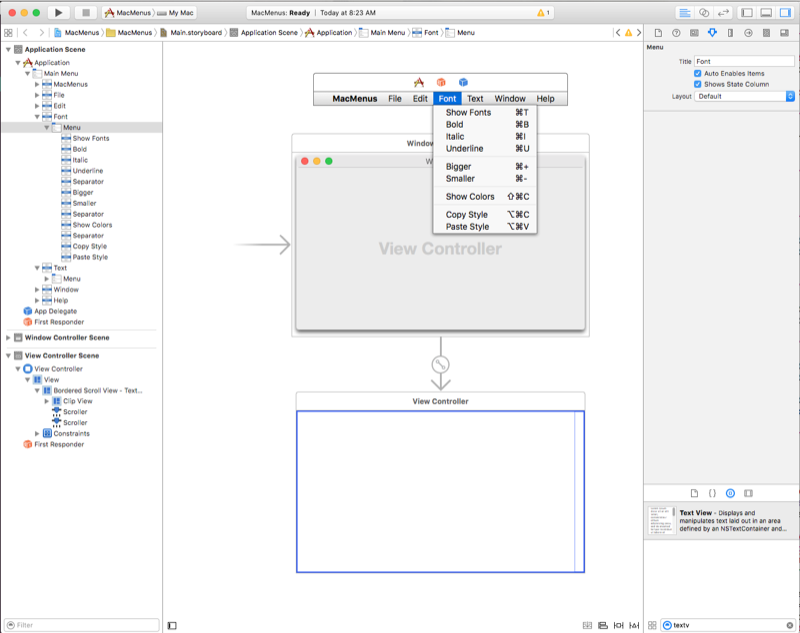 Switch to the Assistant Editor and select the PanelViewController.h file. 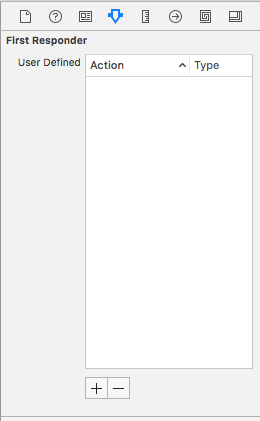 Next let's look at creating status bar menus. Status bar menus display a collection of status menu items that provide interaction with or feedback to the user, such as a menu or an image reflecting an application’s state. 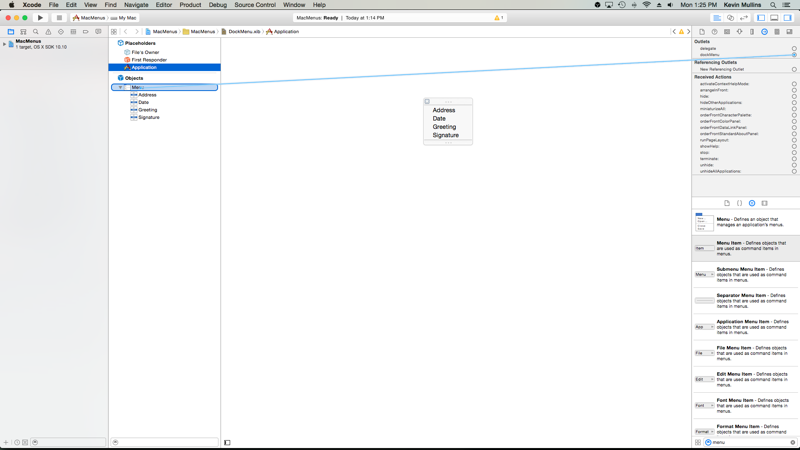 An application's status bar menu is enabled and active even if the application is running in the background. The system-wide status bar resides at the right side of the application menu bar and is the only Status Bar currently available in macOS. NSStatusBar statusBar = NSStatusBar.SystemStatusBar; gives us access to the system-wide status bar. var item = statusBar.CreateStatusItem (NSStatusItemLength.Variable); creates a new status bar item. From there we create a menu and a number of menu items and attach the menu to the status bar item we just created. Next, let's look at creating custom dock menu items. 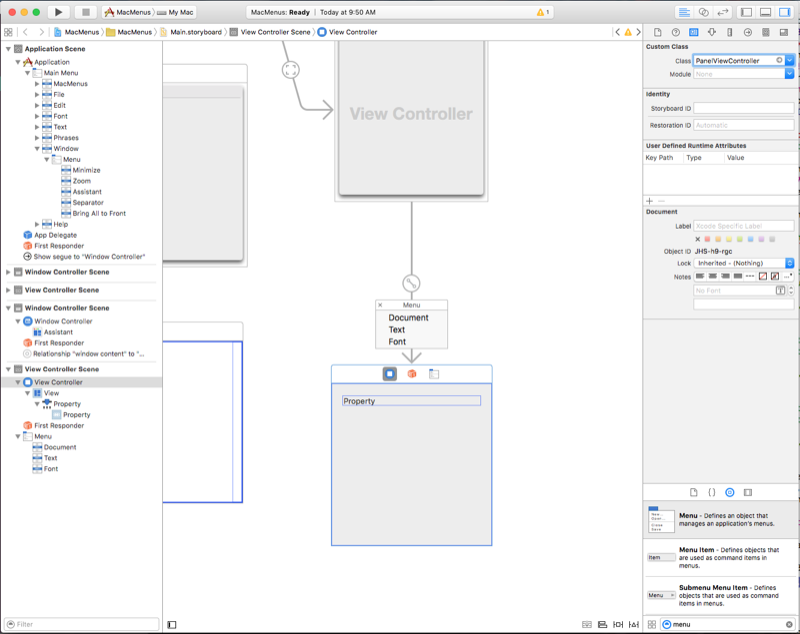 Save your changes and switch back to Visual Studio for Mac to sync with Xcode. If we select one of the custom items from the menu, the text in our text view will be modified. A pop-up button displays a selected item and presents a list of options to select from when clicked by the user. A pull-down list is a type of pop-up button usually used for selecting commands specific to the context of the current task. Both can appear anywhere in a window. You can create and work with pull-down lists in the exact same way as pop-up buttons. Instead of attaching to existing action, you could create your own custom actions just like we did for our contextual menu in the Contextual Menus section. 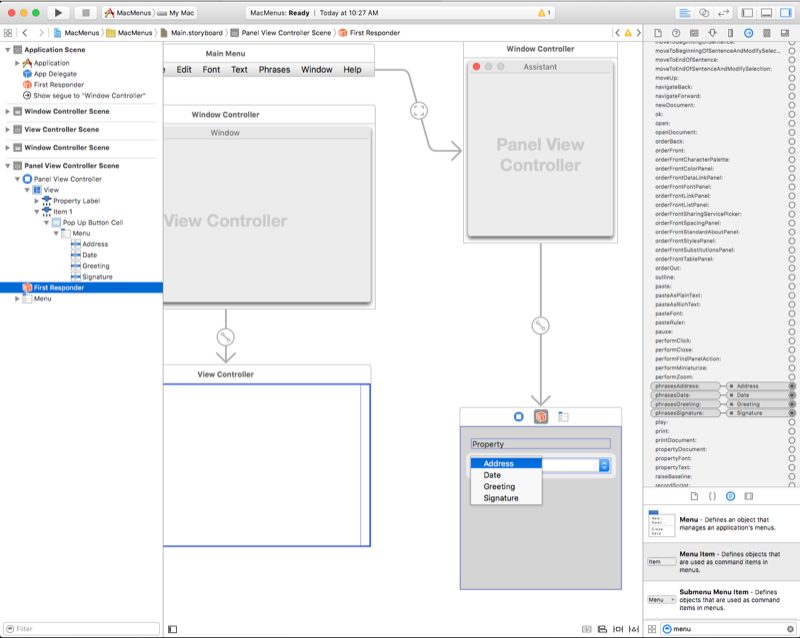 This article has taken a detailed look at working with menus and menu items in a Xamarin.Mac application. First we examined the application's menu bar, then we looked at creating contextual menus, next we examined status bar menus and custom dock menus. Finally, we covered pop-up menus and pull-down Lists.